Earn $12.11 in Rewards credit (1211 points) What's This? 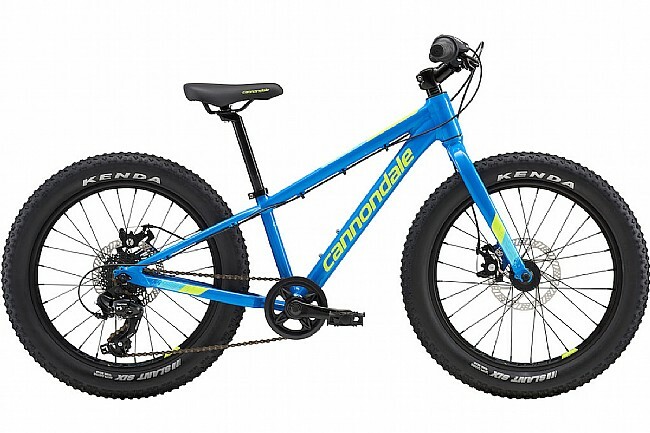 Cannondale’s 2018 Cujo 20” Plus Kids Mountain Bike is a lightweight, smooth welded SmartForm C2 Alloy disc brake mountain bike for kids with a rigid fork, 20-inch wheels, and big tires for impressive grip and a smooth ride. Fork: Rigid, SmartForm C2 Alloy, 1-1/8" steerer, IS disc mount. Headset: FSA, Alloy, 1-1/8" Ahead, integrated. Cassette: Sunrace, 7-speed cassette, 11-34. Brakeset: Tektro cable actuated mechanical disc. Handlebar: Lightweight Alloy, 580 mm wide, 25.4mm. Rims: Cannondale C4 Disc, lightweight alloy, double wall, 20", 29mm inner width, 28H. Hubs: Formula, 7-speed freehub, disc. Tires: Kenda Slant 6, 20x2.6".